Below are details of our most recent work, including a brief explanation of the features of the design and kitchen style. All of our work is contained within the Photo Galleries accessible above. It doesn't matter how large or small your available space is, any of the features of the kitchens photographed can be incorporated into your design and our kitchen design is tailored to your budget and your requirements. Whether your kitchen is large or small, you will be treated the same - as a valuable customer who we want to help create a dream kitchen. 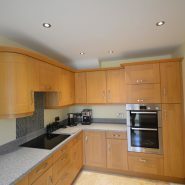 Traditional In-Frame kitchen design and kitchen installation by Unitech Oxon, Banbury. 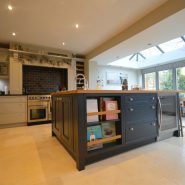 We were involved with this project during the extension planning phase and as such we were able to work closely with our client to assist them in planning their kitchen and the best use of their new space. This saw the installation of an in-frame painted kitchen, very much in keeping with the traditional nature of their property and further enhanced by a Britannia range cooker and Cimstone worksurfaces. 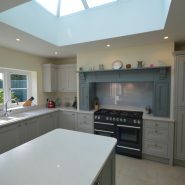 A mixture of painted finishes helps add to the style of this kitchen, aided by the roof lanterns to provide a large, light and airy space overlooking the garden. 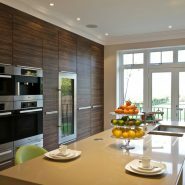 Contemporary kitchen design and kitchen installation by Unitech Oxon, Banbury. This large, bright space showcases modern living, with kitchen, dining, home study and living space all in one. Featuring an ultra modern handleless look, this modern kitchen took advantage of a small extension to create the stunning space you see below.This modern kitchen features coloured glass splashbacks to the walls, LED lighting to plinth's, under cabinets and additionally within the cabinets too, as well as featuring a respectful acknowledgement to the era of the property by retaining the period AGA, despite the installation of the latest SMEG ovens. This much larger than average kitchen also incorporates a large family area and social space, including bi-fold doors to the garden following a sympathetic extension to a period cottage. The extension and indeed traditional kitchen design also incorporates an original water well, with the seating area and glass surface directly above showcasing this beautifully and complemented by curved kitchen units too. A Rangemaster oven and belfast sink are further design touches to complement the traditional look of this kitchen.